If you’re a plant manager in the United States in the market for new industrial heating equipment, you’ve likely discovered that there are many providers worldwide to choose from. While there are many factors that will likely impact the provider you ultimately decide to work with, here are a few reasons why buying industrial heating equipment made in the United States is beneficial for organizations in a variety of industries. For companies based in the US, the fact that the industrial heating equipment from American providers is being manufactured in the US means that it can likely get to your plant location faster. If you are replacing a piece of equipment that has broken, this means less downtime. You can get your plant up and running faster, which means less profit loss and more productivity. Having customer service based in the US is incredibly helpful if you want prompt, helpful attention from your industrial heating equipment provider. Though we can’t speak for all American heating equipment suppliers, here at American Heating Company we pride ourselves on providing helpful, US-based customer service. You’ll connect with someone who speaks your language and is a knowledgeable resource that can help you problem solve any and all matters related to your industrial heating equipment. If necessary, a representative can even come to your location to assess the situation and help you find a solution. In some cases, buying “local” within the US can ultimately save your plant some money. Since American made products do not have to be shipped internationally to reach US-based businesses, transport costs tend to be lower. Additionally, US products can often reach US organizations in a shorter time frame, a huge cost benefit if your plant is down and you are waiting on a piece of equipment to get it up and running again. When you buy US made industrial heating equipment, you can feel confident knowing that the products you are purchasing were manufactured by employees who are treated well and compensated fairly. In addition, heating equipment that is manufactured in the US adheres to the high standards set forth by governing organizations in the US. When you buy American heating equipment, you can rest assured that US safety, quality, and manufacturing standards have been met. Manufacturing is a huge component of the US economy, but as time goes on more and more companies are moving their manufacturing efforts overseas. Large capital projects and equipment purchases give companies the opportunity to support American manufacturers and the American economy as a whole. By purchasing industrial heating equipment from a US company, you are utilizing your organization’s funds to support American manufacturing and keeping money in the US economy while purchasing a piece of equipment that will benefit your business. Though narrowing your search for an industrial heating machinery provider to the United States may reduce the number of equipment providers you have to choose from, there are a number of reasons why buying US made heating equipment is a good idea. Want to take advantage of the benefits of buying American? 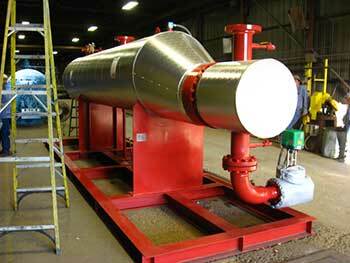 Looking for a reliable US industrial heating equipment provider? Consider American Heating Company! With decades of experience providing high quality heating equipment to companies in a variety of industries, we have established ourselves as a trusted resource for durable, long-lasting industrial heating equipment. Contact us today to request a quote or give us a call at (973) 777-0100 to learn more about how our American made thermal fluid heating systems and heating products can benefit your business!